Rival alphas Juli Gunby and Neil Statham want to tear each other apart — but will they do it in battle or as mates? When Juli Gunby left Missoula, Montana, she didn’t intend to come back. Not to her exacting alpha werewolf father, and certainly not to Neil Statham, the beta who rejected Juli’s girlish advances. Her father, as usual, has other ideas, using his dying breath to pass pack leadership to his daughter. Juli resolves to carry out her duty to her father and her pack, but the one man she wants on her side has made himself her enemy. After years of loyal service to the pack, Neil expects to take over as alpha when his mentor dies. As good as it is to see Juli again, he knows he can’t trust her. After all, she abandoned both him and the pack years ago and never looked back. 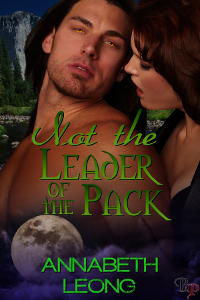 Neil determines to fight for his rightful position in the pack, even if that means going up against a woman who fills him with an overwhelming urge to mate every time she walks into the room. Someone needs to lead, and the more Neil and Juli fight, the more they attract interference from those who would control the pack and destroy the ties between them. He would have kept talking, except that Juli wrenched herself violently out of his grasp at that point. “Not interested in this pack? We can say whatever we want?” He heard her just fine over the music despite the new distance between them. In fact, he worried who else had heard her mention the pack. And who else had seen that furry paw she’d thrust into his face. They both froze for a second, staring at her latest lapse of control. “Damn it.” Juli’s curse came out more as a growl than as words. “We need to get out of here,” Neil said. “You just focus on staying cool.” She knew better than to argue with him. He grabbed her hand and pulled her out, leaving their beers behind. They could finish this conversation in his truck. They ran for the truck like the rest of the world was on fire, and slammed the doors behind them once they got there. Juli writhed in her seat, gasping, her wolf form rippling just on the other side of her skin. Neil panted in response. He didn’t normally have trouble controlling his shift, but with her beside him, so close, too much of him wanted to meet her in a place of complete abandon. He wanted to run with her under the moon, fight her for supremacy until neither cared who wound up on top or on the bottom. Then, with one last vicious pounce, he wanted to surrender to the merging of their bodies. He swallowed hard. “Back to the hospital.” She showed fangs. Neil didn’t need that so soon after he’d regained his own control. He stopped arguing and pressed the gas. They’d go somewhere. He just needed to be driving so he had something to concentrate on besides the idea of Juli giving herself up to the beast. He needed a really good reason to remain in human form. The truck’s cab filled with her labored breathing. Neil turned on the radio to distract himself from the sexual images the sound called up for him. He’d always avoided being alone with her, afraid to give even the appearance of impropriety. Right then, Neil wasn’t sure if he was grateful for the trouble he’d saved himself or sorry as hell for what he’d missed. The instinctual attraction he felt for her was off the charts. Not the Leader of the Pack stands alone, but Annabeth has written in its world before. She’d love to share the previous title, Not His Territory, with current readers. If you’d like to participate, e-mail proof of purchase of Not the Leader of the Pack, such as an Amazon receipt, to annabeth dot leong at gmail dot com and let her know your e-book format of choice. Annabeth will buy a copy of Not His Territory for the first 25 people who respond.